I don't know if pilgrimages are idolatrous or have to do with "graven images", all expressly forbidden by our Three Great Monotheistic Faiths. Maybe you're just curious—"Ah, so this is where it all started. Interesting." However, even though you know that God is everywhere, if you then start talking to and touching walls and rocks and cave surfaces, some of which are pretty graven, maybe you're trying to tap into or bargain for some special energy, something electric and tangible to help get you through life —well, then, maybe... but, thankfully, these are Thomistic distinctions that I can happily leave to Thom. And that is all I shall have to say on "...why folk long to go on pilgrimage." If you leave from Naples and head east for the Gargano promontory, the "spur" that juts out into the Adriatic on the other side of Italy, you pass through Avellino and have the feeling that you can coast the 125 km down the other side of the Apennines to Foggia. You can't. Foggia, one of the provincial capitals in the region of Puglia, is at an altitude of 76 meters on the "Tavoliere," the fertile and well-cultivated Apulian plain, called the granary of Italy, the "breadbasket," a 4,800 km²/1800 mi² table-land. Strangely, at the wrong time of the year, before the bountiful potential lurking in those fields starts to spill out, the area is orderly, yes, but unpleasantly empty and yellow, even arid. You stick to the ring-road around Foggia, get off and head NE and then start to see the Gargano ridge rising undramatically from the left of your field of vision. No real mountains, as such—just a promontory, the highest point of which is just over 1,000 meters. 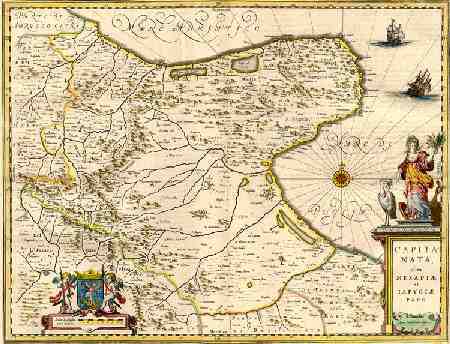 It's 35 km from Foggia in a straight line down to Manfredonia, the harbor town on the south, right in the crook, where the spur rejoins the north-south line of the coast. From there you wind back up to 800 meters along a mountain road, switching back again and again up the chalky white south face of the Gargano. It's a karst mountain with plenty of caves from sea-level up to the top, but the geology doesn't display any of the spectacular mini-Dolomite formations that you find in other karst areas in the south— the Cilento, for example. You are now in Monte Sant'Angelo (photo, right), one the seven places in Italy that make up UNESCO's recent conglomerate World Heritage Site, The Lombards in Italy, the Places of Power (568-774 AD). 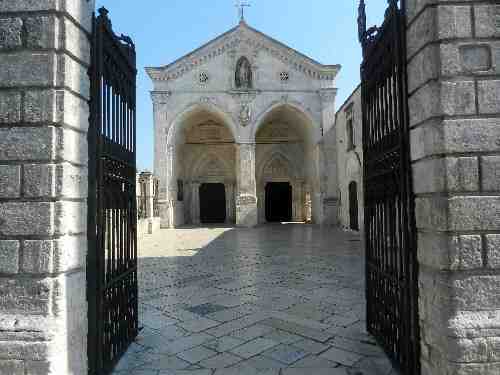 Monte Sant'Angelo is a town of about 15,000; it holds a special place in the religious history of Italy—indeed, of Europe. 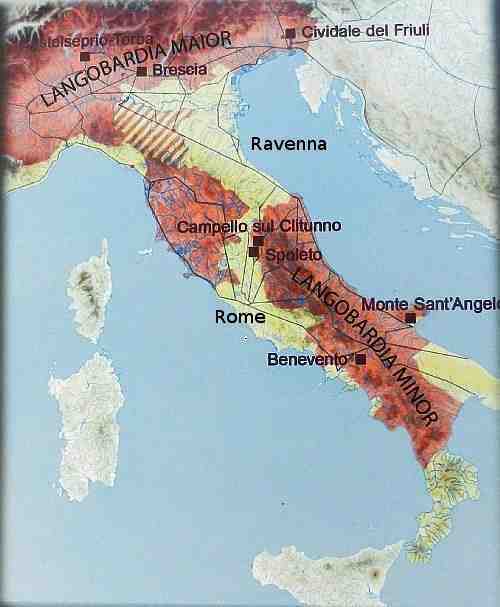 This UNESCO graphic (below, right) shows the piecemeal nature of the Lombard Kingdom of Italy.The upper group of duchies are separated from the lower ones by a broad swath of property that belonged to the western church (the duchy of Rome) and what was left of Byzantine presence in northern Italy, the Greek Exarchate (vice-realm), extending down from Ravenna. The Exarchate was conquered by the Lombards in 753 and then restored by Pepin, King of the Franks (Charlemagne's father), and given NOT back to the Greeks but rather to the duchy of Rome. This fusion was the basis of the Vatican States that would last until 1861. The Lombards (also Longobards) came into Italy from the north in the mid-500s AD, apparently pushed south by a rather aggressive and expansive nomadic people called the Avars, about whom little is known. The Lombards met with almost no resistance. Italy was exhausted after the so-called Gothic Wars, a twenty-year period of devastating struggle between the Ostrogoths (who had brought about the fall of the Western Roman Empire in the first place) and the invading Byzantine forces of Justinian, bent on reconstituting the Empire. Justinian won but his own forces were so depleted by then that they were no match for fresh invaders. The Greeks withdrew to enclaves and left the rest to the Lombards, who by the late 570s had set up a kingdom, later named Regnum Italicum ("Kingdom of Italy"), which reached its height in the mid-700s. It was more of a confederation of duchies than a unified kingdom; indeed, one speaks of the Lombard duchies separately—the Duchy of Benevento, of Friuli, of Spoleto, etc., with the whole period commonly called "the rule of dukes" since there was no unifying monarchy. (In 774 the northern Lombard holdings would be taken by Charlemagne, and the southern part by the Normans in the 11th century.) The Lombards still live on in the memory of the modern Italian nation in the name of the Region of Lombardia and in towns such as Lombardi and even Longobardi. That has given Christian art another common depiction of Michael—slaying a serpent or dragon or a fallen angel, one of the hosts of Satan. Devotion to Michael was congenial to the Lombards, for he was like their earlier Germanic deity, Woden, a healer yet the god of war and protector of heroes and warriors. This, no doubt, hastened the Christianization of the Lombards. 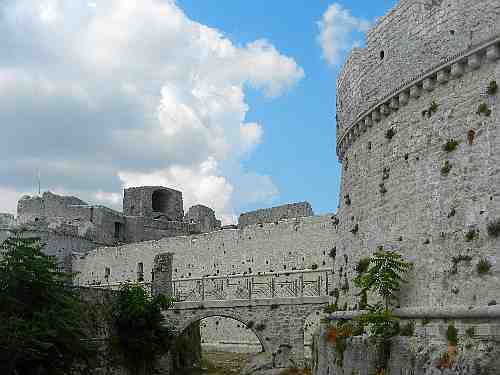 The Gargano, itself, had a long history of myth and ritual from before the Christian era. The area is rugged and covered by forests and ravines. Many of the myths and rites had to do with curative waters and the practice called incubatio, a rite whereby one slept by a sacred place in order to have divine revelations the next morning. 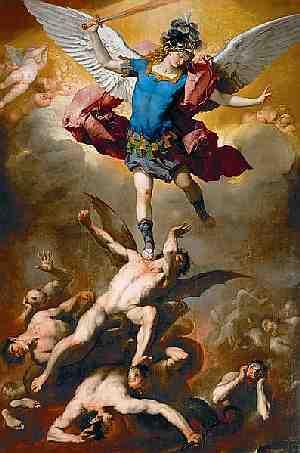 These earlier rites then left their traces in the cult of St. Michael. The man-made structures within the later sanctuary reshaped what had originally been simply a natural cave. The inscriptions within the site let us follow the evolution of the grotto into a full-fledged place of religious expression that welcomed pilgrims from distant places and offered them hospitality. Devotion to St. Michael produced a rich mix of faith, art and culture between the 500s and 700s. With the Lombards the sanctuary at Monte Sant'Angelo became one of the most important places of worship in Christendom and a destination for pilgrims, a stage on the road that led to the Holy Land. That road was really the ancient via Traiana (Trajan Way), the Roman road from Benevento to Brindisi, at which point travelers embarked for Jerusalem. Under the Lombards the route became known as the via Sacra Langobardorum [Holy Road of the Lombards] and may be seen as a precursor of the other famous route of pilgrims, the via Francigena. Both channeled pilgrims from as far away as Britain. The Lombards were thus responsible for the development and growth of devotion to the Archangel Michael. The names of such Lombard nobility as Queen Ansa, Romualdo II, and of Gisulfo II found on the walls of the sanctuary attest to the relationship between the Lombards and Saint Michael, as do the tales of apparitions of the saint. There is some documentary reference to apparitions in the 490s, but none earlier than that; then, there follow 15 centuries of incremental sanctuary building dedicated to Michael, the Sant'Angelo, the Angel Saint. The main church is essentially an entrance to the Grotto Basilica, popularly termed the Celestial Basilica. The grotto below the main entrance is multi-level with stairways (image, above) leading to various devotional stopping points contained within the main "cave church," the grotto. The prominent tower (#1, above) next to the surface-level entrance (#2, above) is from the 1200s and is called the Angevin Tower; it is an Angevin expansion of an earlier tower built by their Swabian predecessor, emperor Frederick II. It was meant to be a watch-tower similar to those in place in Frederick's famous and very odd Castel del Monte not far from here. The building at the main entrance of the sanctuary, the first thing you see from the street, is called the Upper Atrium. It was built in 1656 in honor of all those who had died in the recent plague. 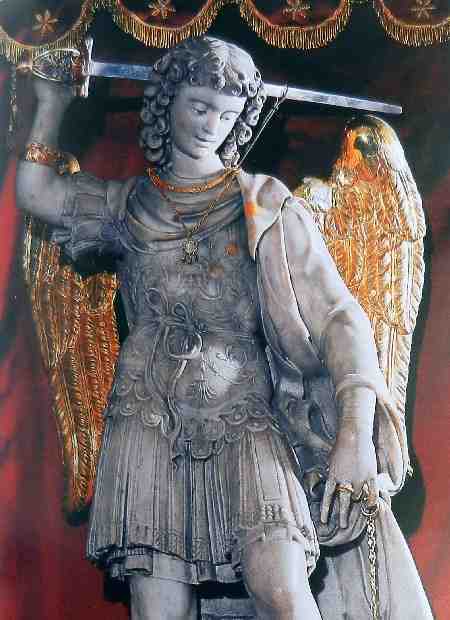 If there is a centerpiece of the entire complex, it is the statue of Saint Michael (detail, right), closed in a silver and Bohemian glass urn. It is of Carrara marble, 1 meter 30 cm tall and is the work of Andrea Contucci, also known as Sansovino (1467-1529). It was placed in the grotto in 1507. The statue is widely reproduced at sites throughout Monte Sant'Angelo, such as on the facade of the Upper Atrium, itself, or facades of other buildings, or in squares, etc., as well as being the theme for countless variations in the form of miniature souvenirs. Indeed, there was a time in the 1400s when permission, by royal decree, to render miniature reproductions of St. Michael was limited to a special class of local sculptors called sammecalère. They are responsible for the many variations on Contucci's original, each slightly different from the next, that we still see today. The earliest traces left by pilgrims date to the 6th century. The pilgrims include high-ranking members of the Church, members of royal families, noblemen and representatives from the common people. One should note the presence—unique in Italy—of at least five inscriptions written in letters of the ancient Runic alphabet (image above, the inscription of the monk, Hereberecht); they were left by Anglo-Saxon pilgrims and bear witness to the European dimension of this pilgrimage in the early Middle Ages. There has been a devotional museum on the premises since 1989; it holds gifts given to the sanctuary over the centuries by pilgrims. Monte Sant'Angelo, itself, shows distinct features in how it is laid out as well as in historical and artistic sights; it is one of the most interesting examples in Apulia of a "hill town." The buildings follow the natural level curves of the mountain, and the town could be defended by a castle (photo, right) set at the highest part of the settlement. There was a primitive fortification from the 800s; then came the first three dynasties of the kingdom of Sicily, then Naples: the Normans, the Swabians (Hohenstaufen), and the Angevins, each of which expanded the castle. The second one is the most interesting to me since this is where Bianca Lancia, Frederick II's wife, lived and where she bore three children, Costanza, Violante, and Manfredi. It is, however, the sanctuary of Archangel Michael that has always determined the development of the historical center of Monte Sant'Angelo. 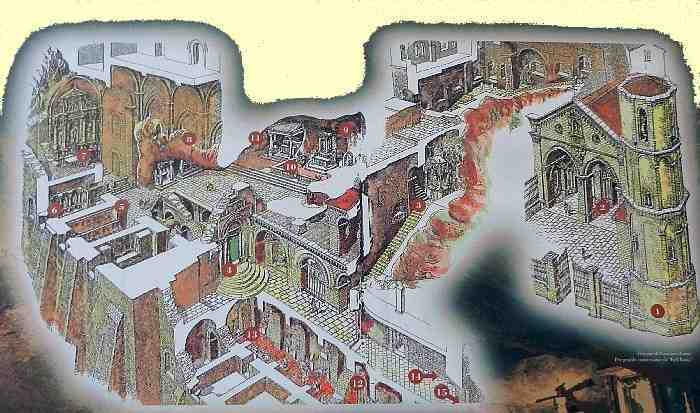 Most of the buildings within both the first and the second circle of walls, i.e. those built between the 11th and the 13th century, had to do with religious activities and the need to care for pilgrims. The world is still full of the faithful of many spiritual and religious persuasions who go on pilgrimages, and thus they still come to Monte Sant'Angelo. Besides the original sanctuary of St. Michael, there are now at least a dozen other houses of worship in the town. Modern pilgrims can be accommodated in hotels as well as in a modern 50-room Sanctuary Guest House. Or they can find a cave. There are still plenty of those.